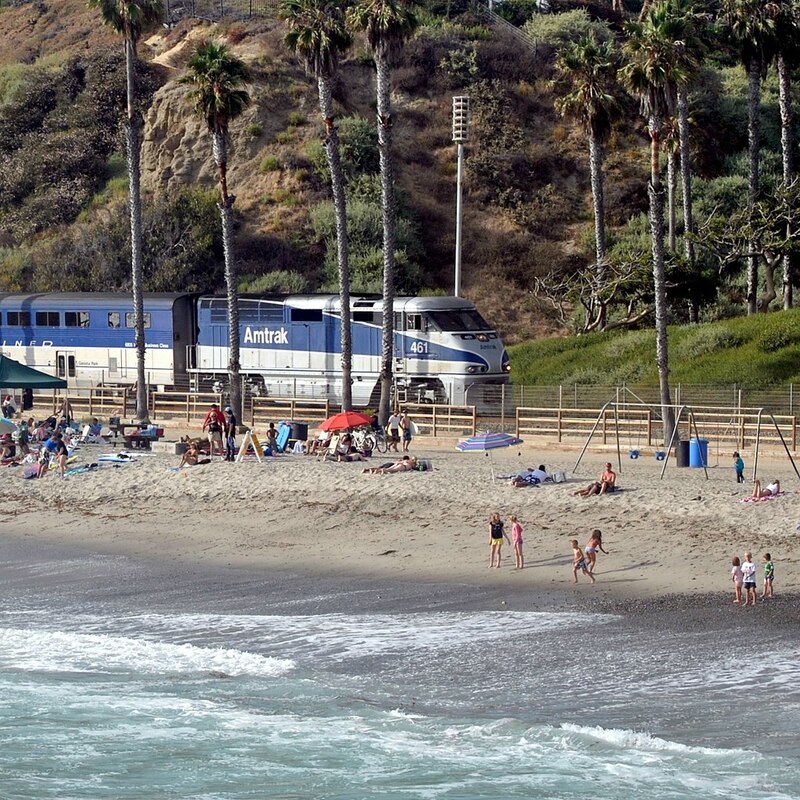 Amtrak's Pacific Surfliner rolls past the beach in San Clemente, CA. GUEST BLOG / By Adam Lottes, PillartoPost.org Travel Writer--Taking a day trip, a few hours away from the rough and tumble of daily life, is exhilarating and overflows with excitement. A chance to escape our nine to five and our established responsibilities. Many of us favor trips to the beach letting the sun color us darker and the sand find its way into every crevice and fold of fabric. 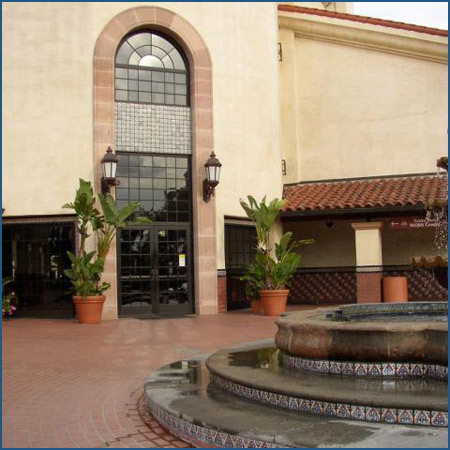 Others prefer a day in Balboa Park exploring the museums bursting with heritage, history and hidden treasures of an age long gone. What about truly escaping via the confines of a train? Being that I don’t hold a driver’s license I take the train often. Stepping onto the platform awaiting the vehicle that will whisk me up the coast always makes me tingle with anticipation. A watch around me as other soon to be passengers mill around keeping a close eye on their baggage. You can sense the building excitement from them as well. Granted, they are traveling for work and not really getting away. But I am. I await the arrival of the train in Oceanside on a lightly overcast day. As I wait the cloud cover slowly rolls back revealing one our flawless beautiful days. I inhale the fresh scent of the ocean. I am traveling to Santa Ana, just an hours journey north via rail. I have a book in my bag and am eager to begin my journey. The voice of an Amtrak clerk blares from the speaker overhead. I stand instantly as I hear the horn in the distance. The train is on its way. It is just minutes away. Down the road the markers fall into place blocking traffic from the tracks, their yellow lights blinking rapidly as a warning of the oncoming train. And then, there it is barreling down the tracks. My escape for the day has arrived. At first it is small and then suddenly, like something jumping out of hyperspace, it is right in front of me. Locomotives of today bear little resemble to the classic ones from way back when. This one is a rectangle on wheels streaked with dirt and soot from moving at high speeds and years of wear. It’s a towering silver-grey with a blue line painted down the center traveling horizontally down the car. Pacific Surfliner it says. 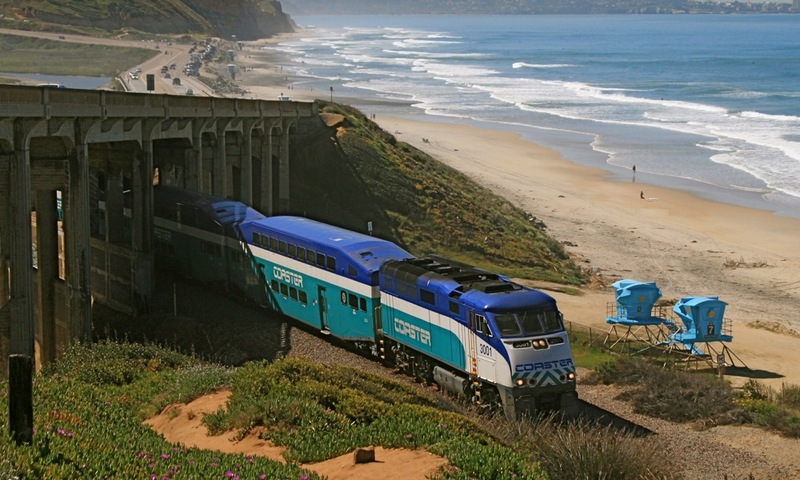 It is appropriately named as this train with coast literally up the coast. In some places it looks like the tracks are right on the beach and you wonder how we aren’t sinking into the waves. Thank goodness for the capable hands of engineers and those who built this rail line; we don’t need to worry about such afflictions. They have built a sturdy track that has stood the test of time. I head for the top deck of the train and take pick an open seat on the car designated for business class. The seats are spaced apart more generously than that of the tight coach cars. Quieter too as most passengers aboard are business people traveling to or from work. They whisper into their phones and type frantically into their laptops, not one of them noticing my laid-back and care-free spirit sitting amongst them. I pick a seat next to the window on the coastal side of the car. It’s comfortable and plush making me glad I shelled out a few more dollars for this seat. As I get comfortable the conductor makes an announcement telling us we are on the move. Sure to his word the train jolts forward and my day away has begun. One of the many things I love about train travel is the gentle rocking motion as the car sways back and forth over the tracks. It’s soothing and relaxing. I’m already in a relaxed mood but now a nap threatens to steal the trip from me as I feel my lids grow heavy. As if sensing my pending demise a conductor comes along asking for tickets. They no longer punch a hole into them. Now they scan the tickets as they have an electronic barcode printed on them. They place a pastel colored strip of paper above my seat; a secret code for the Amtrak staff letting them know they’ll be down a passenger in the near future. I glance out the window and take in the scene of the ocean beating against the beach. The sky is now clear and bluer than I have ever seen it. My attention is suddenly diverted by a friendly face asking if I would like a snack or beverage. Unlike the airlines I am not nickeled and dimed aboard this wondrous vehicle. I agree to both and soon am being hand delivered a snack pack and an entire can of soda. Yes, I get the whole can here in business class. Feeling like a king I did into my snacks and sip from my royal beverage. Soon I find myself lost in thought and staring absent-mindedly out the window. Beach goers are sun-bathing, biking, jogging and playing volleyball as we thunder past at break neck speed. By now I am giddy with excitement as we draw ever nearer to my destination. It isn’t that I grow tired of the train. In fact, I could ride this train all day and all night. Perhaps even many days in a row. I absolutely love train travel and when I arrive in Santa Ana and have to step off this grand vehicle I am just a tad bit saddened to have to leave it. Even as I think about de-boarding I am notified that we are nearing the Santa Ana Train Depot. 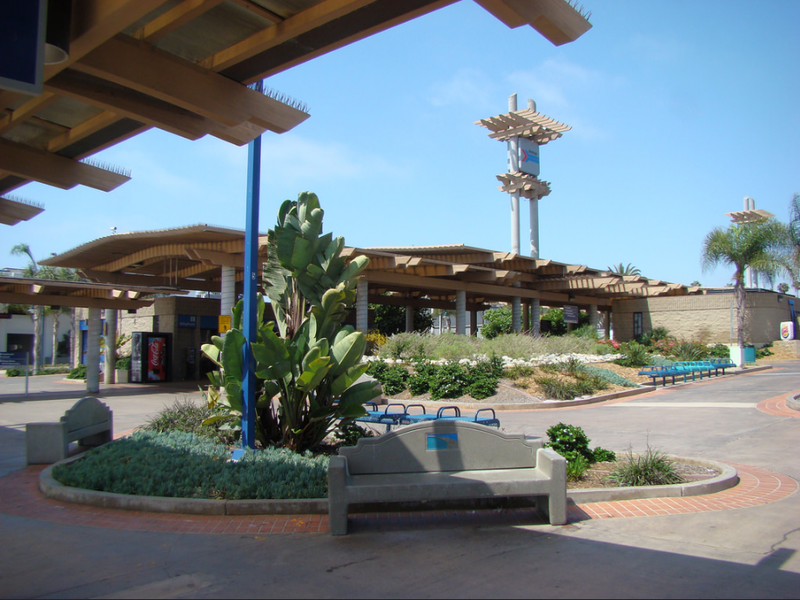 The station in Oceanside is one that is built for commuters and travelers and is probably one of the busiest stops in southern California. 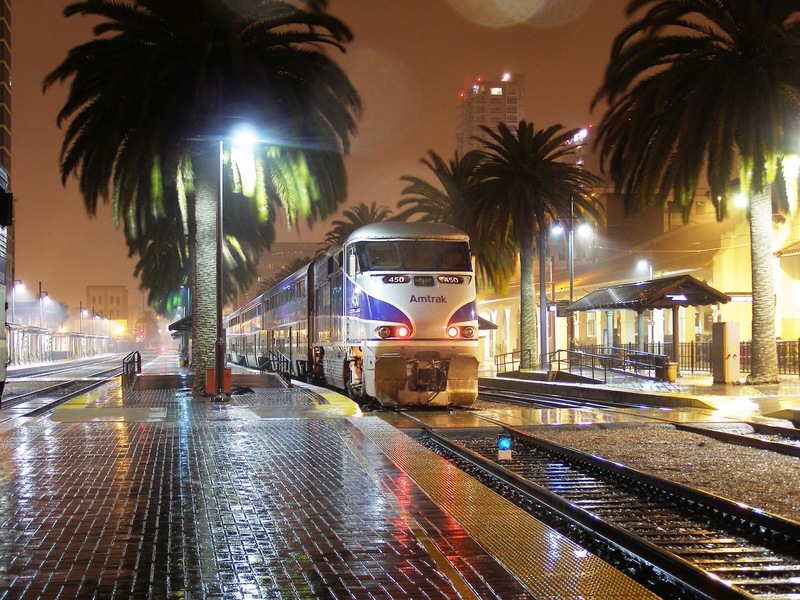 However, the one in Santa Ana is a monument to train travel. It’s a grand station covered in terra cotta roof shingles and painted a taupe color with rich brown clay tiles. Wood benches, no doubt hand-crafted long ago, sit side by side in the station happy to be a place of reprieve for the many travelers passing through. I step off the train and feel that little tug to get back on. But my rowdy and dear friends are awaiting me out front by the fountain that is void of water due to the drought in our fine state. Instead we see the detail and craftsmanship that adorns the fountain and is hidden by the sprays of water. As I open the heavy iron door and exit into the Santa Ana heat I turn to pause and take in this majestic station. Its high tower is the center of the depot lined with windows for a glimpse into the world of train travel. Soon lunch and a few drinks will be over and I will once again step aboard the Pacific Surfliner, heading home at a pace that is a bit faster than I would like as I don’t want my day of escape to well, escape me too soon. Adam Lottes writes book reviews and travel articles when he’s not operating his online retail book, clothing and gift store, The Secret Stash. For more on the Stash click here. 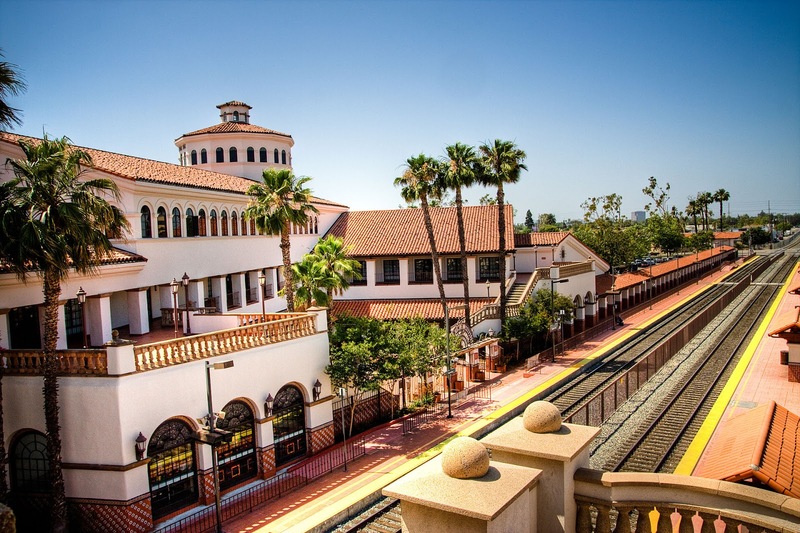 MORE ON THE SANTA ANA DEPOT Click here. Departing San Diego via the beach between Torrey Pines State Park and the City of Del Mar. Pacific Surfliner shares the tracks with local "Coaster" commuter.